Talk with your doctor about these issues to get his or her input, but also remember deciding to return to work during cancer treatment is a very personal decision. Two people with the same diagnosis and treatment plan may feel very differently about the subject, so the ultimate decision will be based on how you feel both physically and emotionally. For some people, their job or career is a big part of the foundation of their identity. A survey conducted by the non-profit Cancer and Careers, which offers a wide range of resources to support people returning to work and getting back to their everyday lives after a cancer diagnosis, found that 48% of those surveyed said they continued to work during treatment because they wanted to keep their lives as normal as possible and 38% said they worked so that they felt productive. 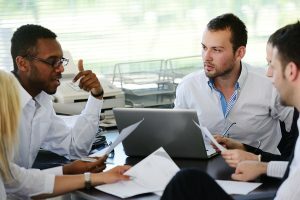 Being in the workforce also provides a connection to a supportive social system for many people and boosts their self-esteem and quality of life. In some cases, the side effects of treatment, such as fatigue, nausea and gastrointestinal problems, and memory and thinking problems that chemotherapy and radiation may cause, may mean that returning to work during treatment isn’t feasible. Some people also decide that this is a time during which they would prefer to focus on spending time with family and loved ones rather than spending time at work. If work was stressful even before you were diagnosed with cancer, taking time off can reduce your stress, which can have a positive physical and psychological effect. Make a plan and consult your supervisor: Working during treatment may mean that you need to change your schedule to accommodate physician appointments, treatments, and any recovery time you need after treatment or when you’re experiencing side effects. For example, you may need to work fewer hours per day or week or work from home for a period of time. If your job is physically taxing, you may also need to modify your duties during treatment. Ask your doctor if there are any restrictions on what you can do, then talk with your supervisor about company policies and share your needs so that you can develop a schedule and a plan that works for both of you. Take care of yourself: Getting adequate sleep, eating a healthy diet, managing stress, and being active (within any guidelines your doctor provides) can help you feel better and decrease the impact of some side effects during treatment. Ask your doctor to recommend support groups or professionals such as nutritionists, rehabilitation specialists, and mental health providers who can help you build a plan to feel as healthy as possible during treatment. Learn that it’s alright to say no: During treatment, you may not have the energy to go all out at work all the time. You may need to tell your supervisor and co-workers that you’re not currently able to work extra hours or take on additional responsibilities. Schedule treatments so you have recovery time: Ask your doctor how soon side effects may begin to occur after treatment and schedule treatments like chemotherapy late in the day or at the end of the week so that you can use the weekend as recovery time. Consider what information you want to share with your co-workers: Think about whether you want to let your co-workers know about your diagnosis and treatment. If you decide you do want to share this information, you may want to start by telling one or two people you’re close to at work. There’s no need to go into details you’d prefer not to share. Simple factual statements, such as, “I’m undergoing cancer treatment and plan to continue working,” can be an effective way to share the information.